This year Carpathian Biosphere Reserve celebrates its 50th Anniversary. This Protected Area is the biggest partner of the European Wilderness Network. It is also a part of the Transnational UNESCO World Heritage site “Ancient and Primeval Beech Forests of the Carpathians and Other Regions of Europe”. Besides this, it is recognised as a UNESCO Biosphere Reserve. Therefore, to no surprise, it became an international platform for nature protection experience exchange during the last decade. 133 people from Austria, Germany, United Kingdom, Hungary, Slovakia, Russia, Switzerland, and Ukraine took part in the events. Carpathian Biosphere Reserve is also one of biggest protected areas in the Ukraine. It covers more than 58 000 ha and represents all the landscape and biodiversity of the Ukrainian Carpathians from foothills to alpine zones. On the 23rd of October European Wilderness Society took part in the International Conference “Problems of Mountain Ecosystem Conservation and Sustainable Use of Biological Resources”. The event was organised by Carpathian Biosphere Reserve. It was an honour to congratulate the staff of this internationally important protected area with the Anniversary as well as to award new Wilderness Diploma for Maramorosh Wilderness. 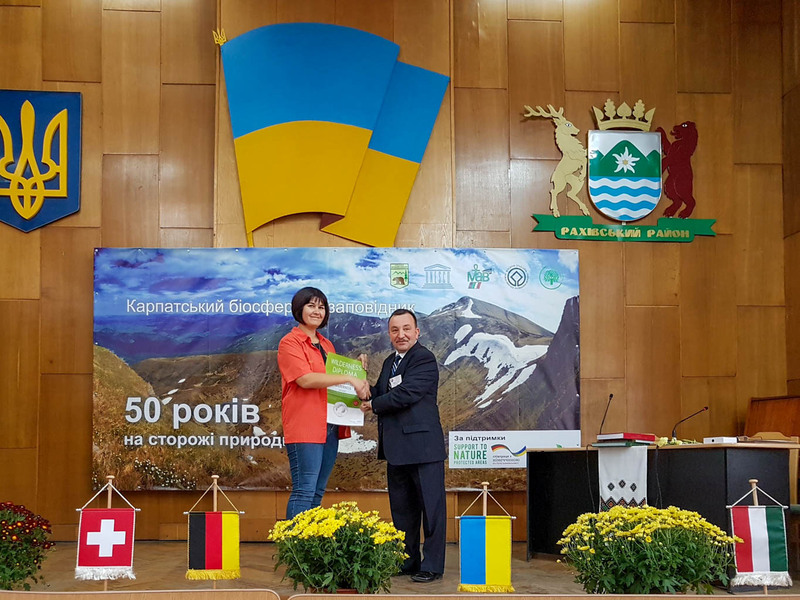 We also took a chance to award another Ukrainian partner of the European Wilderness Network – National Nature Park “Synevyr”. Its Chronyy Dil Wilderness and Darvaika Wilderness joint the Network recently. Representatives of the Parliament, Ministry of Environment and Natural Resources of the Ukraine, regional councils, foreign scientists as well as association of protected areas and many other also congratulated Reserve. Further panel discussions took place. One of the presentation of Vasyl Pokynchereda, deputy head of the scientific-research and international cooperation department of Reserve was dedicated to international cooperation. Mr. Pokynchereda informed about cooperation with European Wilderness Society. Tymur Bedernichek, Ukraine Wilderness advocate, presented concept of the long-term research in the mountains. The research is aiming at reinstalling of the Milos Deyl’s monitoring plots. Continuous monitoring in the Alps led to the conclusion that global climate changes strongly affect fragile subalpine and alpine ecosystems. These conclusion later supported introduction of the international research project, which unfortunately doesn´t include Ukraine. According to the group of Ukrainian researchers, similar important research could be introduced for the Carpathian mountains. Particularly on the Pop Ivan Maramures mountain, where the monitoring plots of this famous Czech scientist Milos Deyl were identified. This project can also become an international, if Romanian partners are interested. There was also a proposal to join efforts with European Wilderness Society in order to monitor Maramorosh Wilderness impact on ecosystems. Meeting of the National Management Committee of the Ukrainian part of the Transnational UNESCO World Heritage site “Ancient and Primeval Beech Forests of the Carpathians and Other Regions of Europe” was also conducted on 23rd of October. Mr. Pokynchereda reported on the participation in the first meeting of the international Joint Management Committee of this object. Other resent issues related to the Ukrainian part of the component were also discussed. European Wilderness Society as a member of the European Beech Forest Network is recently expecting results of the 2 Interreg projects. These projects aimed at improvement of the management of ancient and primeval beech forests through increased knowledge and best practice exchange. The workshop for many Ukrainian protected areas managers was also held on that day. About 80 participants joint the field trip to Chornohora massif of the Reserve on the Conference´s second day. They had a chance to observe primeval forest. The sudden change of the weather didn´t allow the group to reach the Ukrainian highest mountain top Hoverla (2061 m) but let participants experience the beauty of the Carpathian winter. On 25th of October International Workshop as a part of the project “Sustainably Securing Relevant Ecosystem Services through International Cooperation as a Contribution to Conflict Prevention and Regional Stabilisation in Eastern Europe” took place. The event was co-organized by another European Wilderness Society Partner- HNE Eberswalde, Germany. The first part of the workshop concentrated on the general tendencies, legislation, statistics and challenges of international cooperation between and with protected areas in Europe. Representatives of protected areas, educational institutions and NGOs from Germany, Moldova, Romania and the Ukraine contributed to the workshop. Due to the importance of the topic, limited time and broad public involvement further events will be organized to achieve project results. On the kind request of the Reserve, European Wilderness Society developed a project concept dealing with Ukrainian-Romanian Transboundary Wilderness and Wildlife restoration. The project was presented to the Ministry of Environment and Natural Resources of Ukraine. Cooperation to the Maramures Mountains Nature Park, Romania was also proposed. European Wilderness Society is always ready to support wilderness projects as well as individual wilderness advocates across Europe.